Wynn Resorts Limited (WYNN) had a rough 2018. The year started off on the wrong foot after gambling mogul Steve Wynn resigned as CEO and chairman in February amid sexual misconduct allegations. Plus, Wynn’s vital Macau revenues have slowed as its Las Vegas revenues fall. And its overall revenues and earnings appear to be headed in the wrong direction. Wynn Resorts owns and operates both Wynn and Encore in Las Vegas, along with two locations in Macau. Shares of Wynn plummeted in August after the company reported massive declines in revenues and profit at its original Macau resort. The casino giant’s revenues slipped 15% at the Wynn Macau. Meanwhile, sales at the two-year-old Wynn Palace surged 57%, which likely signals cannibalization problems. Still, the Asian gambling mecca has become Wynn’s biggest market. Last quarter, revenues at Wynn Macau climbed 3.1% to reach $579.6 million. Meanwhile, Wynn Palace revenues in Macau surged 39.1% to hit $730.6 million. Wynn’s new Macau location helped the firm’s total revenues pop 10.2% to reach $1.71 billion. With that said, Wynn’s revenues in Las Vegas tumbled 14% to $464.3 million. And Wynn’s adjusted quarterly earnings fell short of expectations. As we mentioned at the top, shares of Wynn have suffered over the last year as investors digest the company’s future following its namesake CEO’s departure and its slumping Vegas revenues. Still, Wynn’s peer group, which includes Caesars Entertainment (CZR), MGM (MGM), Las Vegas Sands (LVS), and others, nearly matched Wynn’s 2018 decline. 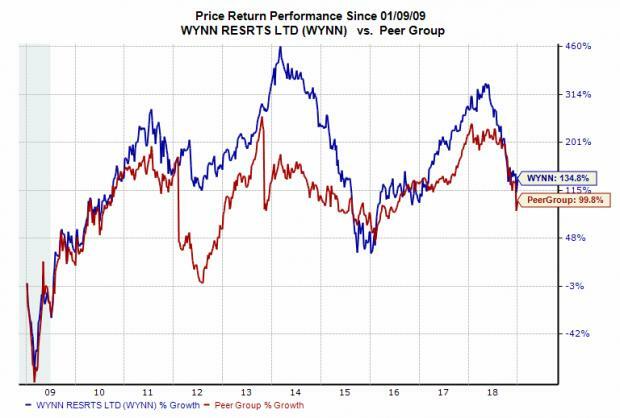 The chart below also shows investors just how turbulent Wynn stock has been over the last decade. Shares of Wynn closed regular trading Thursday down 0.97% at $103.39. This marked a roughly 50% downturn from its 52-week high of $203.63 a share. Moving on, let’s dive into the most important reasons that Wynn is Friday’s Bull of the Day: its top and bottom-line outlook. Our current Zacks Consensus Estimate calls for Wynn’s fourth-quarter revenues to sink 10.9% to reach $1.51 billion. Jumping ahead, the company’s Q1 fiscal 2019 revenues are projected to fall 5.3% to touch $1.62 billion. At the other end of the income statement, the company’s Q4 earnings are expected to drop 16.4% from the year-ago period to hit $1.17 a share. Meanwhile, Wynn’s first quarter 2019 revenues are projected to plummet 25.7%. Peeking even further ahead, the company’s full-year 2019 earnings are projected to sink 9.3% below our 2018 estimate. Investors should also note that Wynn’s earnings revision activity has trended completely in the wrong direction recently. This signals that at least some analysts have turned more negative about the firm’s bottom-line outlook. We should note that earnings growth has been proven to be one of the most effective indicators of positive stock price movement and vice versa. Therefore, Wynn’s dismal looking earnings outlook is likely a bad sign for Wynn stock in the short term. 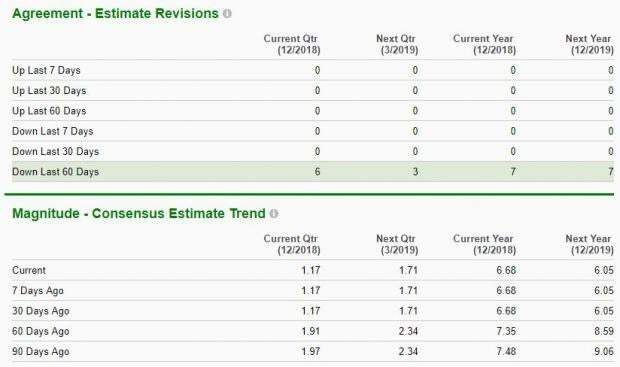 Wynn is a Zacks Rank #5 (Strong Sell) at the moment based, in large part, on its recent downward earnings estimate revision activity. Therefore, Wynn might be a stock to stay away from despite sitting at a massive discount compared to its 52-week high, especially when we look at the economic slowdown in China. Investors interested in the casino and gambling industry might instead turn to Full House Resorts (FLL), Eldorado Resorts (ERI), and Churchill Downs (CHDN), which are all either currently Zacks Rank #1 (Strong Buy) or #2 (Buy) stocks.